Sunday, my stepmother Claire O’Malley, surrounded by my cousins and aunts and Father Mario Castañeda, passed away in Boca Raton, Florida, praying the Rosary with our family. Claire was anointed and received Holy Communion before she died. A few months ago, she had an operation that was unsuccessful and caused a number of complications. However, she was a very healthy person for most of her 90 years and we are very grateful for the long and beautiful life that she had and the wonderful care that she gave to my father in his old age. She really was an integral part of our family and the extended family. She will be fondly remembered and sorely missed. We are delaying the funeral Mass until next week to give time to some of our relatives who are abroad to be able to get back home for the funeral and burial. I want to say that I am very grateful for all the expressions of condolences and the prayers that people have extended for Claire and my family. 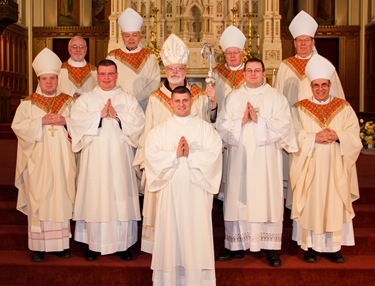 Saturday, as we do every year at this time, we ordained a new class of transitional deacons. 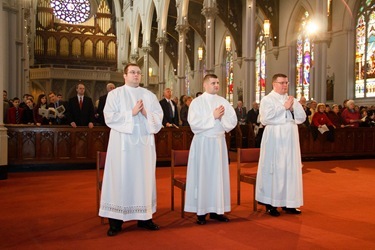 This year, there were three men ordained: Deacons John Cassani, Gerald Souza and Christopher Wallace. 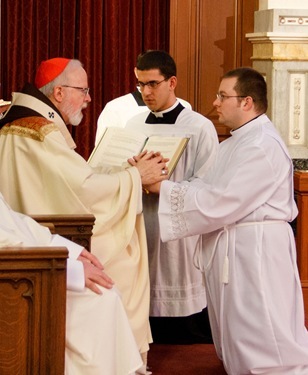 There are two other members of the class who are already deacons and will join them for the priestly ordination in June. 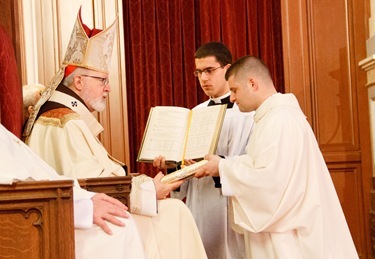 Deacon Tom MacDonald, who is studying in Rome, has already been ordained to the diaconate over the summer and the other classmate is Deacon Jacques McGuffie, who was already a permanent deacon in the archdiocese and has been studying at Blessed John XXIII National Seminary. 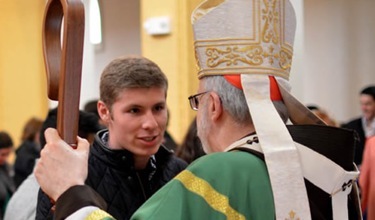 Sunday I visited the campus of Northeastern University to celebrate Mass and visit the Catholic Center there, which is run by the Brotherhood of Hope. We celebrated Mass at the former St. Ann’s Church. The students there have a wonderful musical group. The Mass was very well attended by students, as well as some graduates who had returned to be with us. After the Mass, there was a small reception and we visited the Catholic student Center which is just across the street from the church. We are very blessed to have the Brotherhood of Hope working in the Archdiocese of Boston. They are faith filled men who witness with their lives and the ministry they do is a great blessing. Their community has just elected a new superior, Brother Ken Apuzzo, who will replace Brother Rahl Bunsa, who was with us at the Mass. The new superior will come into office at Pentecost. We want to express our gratitude to Brother Rahl who served three terms as superior and also to congratulate Brother Ken who was elected their recent chapter. We assure him of our prayers and support. 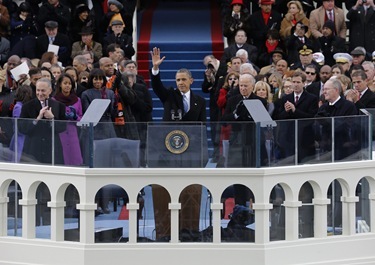 There is great symbolism having the inauguration of the United States’ first black president on Martin Luther King Jr. Day. If it not been for Martin Luther King, is impossible to imagine that an African-American could have been elected to the highest office in the land. We pray for our country at this time and pray that administration will work with the Church to protect the religious freedom and conscience exemptions that have been part and parcel of the history of our country and that are so important to the Catholic community to be able to have space to live our faith and serve the common good in the way that we have always done. 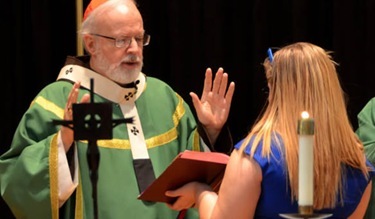 Bishop John D’Arcy has been recently diagnosed with an aggressive form of cancer and will be soon returning to his old diocese. So, Monday morning, we took the opportunity to celebrate Mass with him and his family. 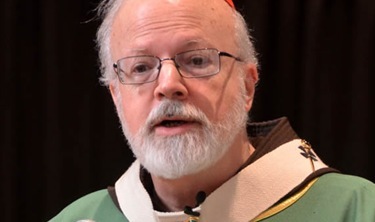 It was wonderful to have a chance to visit with him and thank him for his ministry here in Boston where he was spiritual director at St. John’s, ran the Spiritual Life Office and was, of course, auxiliary bishop. We also thanked him for the wonderful work that he has done as Bishop of South Bend, Indiana. I reminded him that many years ago I went there to do a study of Hispanic ministry for him along with Bishop Tom Daily and Mario Paredes. I had been to Notre Dame, but it was the first time that I had really been to the diocese there. I recalled there was a fine Holy Cross Brother working at the Hispanic ministry office there and we met with many lay leaders and others in Hispanic ministry. 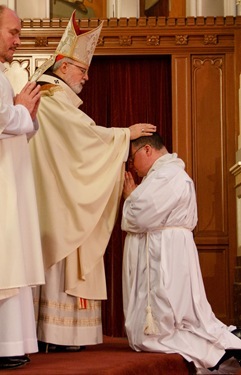 It was a wonderful memory of working with him when he was bishop in the diocese. We are saddened, of course, by his present health situation but we wanted to assure him of our prayers and affection. I also want to encourage all of you to pray for him and his family. Tuesday, I attended the wake of the father of Father Kevin Toomey and also the wake of Father Alexander Keenan, who for several years has been stationed at Most Holy Redeemer Parish in East Boston. Both of the wakes were filled with many people, and I know that was a great consolation to both Father Toomey and to the family of Father Keenan. I also commend them to your prayers. Tuesday we had a gathering for Tom Hannigan, who is retiring from the firm of Ropes and Gray. 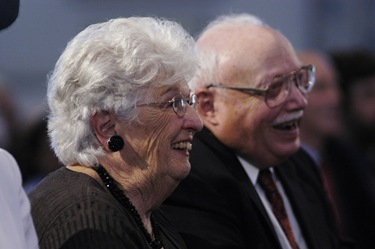 He has been a great blessing for the Church. Tom was a great help to me in Fall River when we were facing the Porter case there. Also, when I came to Boston, one of the first decisions I made was to engage his services because, not only is he an extraordinarily gifted jurist, but he also is a man of deep faith and deep compassion for people in their sufferings. 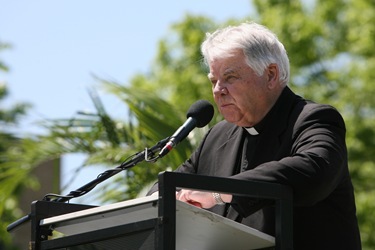 He has always been very, very pastoral in his approach to settling the legal problems that the archdiocese has faced resulting from the clergy abuse crisis. He also accompanied me during my visitation of the archdiocese of Dublin. He is a very thoughtful and faithful Catholic as well as extremely competent professional. 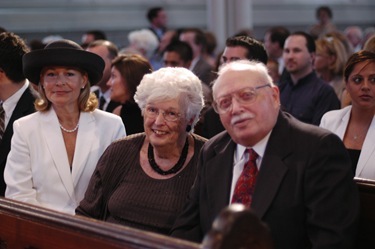 He has made a very important contribution to the life of the Catholic Church in Massachusetts and beyond. We wish him Godspeed in the next stage of his career. I am sure that we will be hearing more about him in his retirement. As you read this, we will just be concluding the events of the March for Life in Washington D.C. I look forward to sharing my experiences of these days with you in my post next week. However, remembering that this is the first March following the death of Nellie Gray, I want to leave you with this video remembrance which I prepared with the help CatholicTV and was played at the March.